Why use Brain Cells in Art? “Bioart” refers to the manipulation of living cells, tissues, or organisms (or their derivatives) for artistic purposes. While artists and biologists have collaborated for centuries to illustrate biological phenomena (you can see some fantastic modern examples of this tradition here), “Bioart” refers to the practice started in the early 1990’s of artists training in and performing techniques from the biological sciences, such as cell culture, genetic engineering, and surgery. Artists have used these technologies to create novel living entities (such as a leather jacket grown in vitro) or modify existing living entities (such as Stelarc’s third ear). These tools provided new options for aesthetic statements (the ability to radically sculpt living tissue to suit particular tastes), ethical statements (if we are growing a small, edible steak in a vat, should we continue to kill cattle for food?) as well as a novel flavor of irony (that “victimless” PETA-endorsed cultured steak required an entire cow’s worth of fetal bovine serum to produce ). Some bio-artworks incorporate living neurons. Early works such as Force and Intelligence used neural culture for its aesthetic and, er, cultural significance. Later however, neural art work began to incorporate the functional aspects of neurons by recording and initiating neural activity. This bi-directional communication allowed for neural culture to control robotic art installations, giving the biological “brain” a robotic “body”. This embodied neural art is a distinctive subset of bioart much for the same reason that neuroethics is a distinctive subset of bioethics- while similar issues can be addressed (is it alive? ), there are a new set of issues that come up (does it feel pain?). In many ways, embodied neural art is the perfect playground for the “extra-rational” side of the neuroethics discussion. Here, novel neural systems, or novel presentations of natural living systems, can be presented to the public in a manner that encourages both critical thinking and the development of new intuitions. Peter Gee (center) explains Silent Barrage's processing loop to two museum attendees standing amid the work's robotic "body." On the wall behind them are shown projections displaying rainbow-colored electrical recordings (left) of the neural activity of the biological "brain" that controls the robots, and the view from the overhead cameras (right) that provide the "sensory input" for the "brain." Photo by Philip Gamblen. As an example of the sorts of ethical discourse embodied neural art can generate, let's examine an issue raised by a particular piece that I just so happen to be familiar with: Silent Barrage. For Silent Barrage, a culture of dissociated rat neurons was given control (over the internet) of a robotic installation that is large enough that audience members could actually walk through it. The culture "observed" the audience members through overhead cameras, and "responded" through movement of the robotics. In this installation, the robotic "body" was a grid of 32 upright 9 foot poles, each with mobile spinning carriages. This robotic grid mapped the installation to the electrode grid in the microelectrode array, leading one audience member to report that “the feeling of physically traveling through an active brain is impossible to escape”. 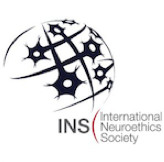 One question that arises from building an “active brain” is whether or not said neural system has an "inner mental life" or "consciousness" that its creators have a moral obligation towards, as they might for a "full" rat. 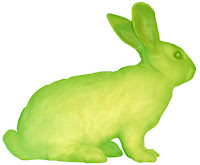 The speculation over the artist's obligation towards Silent Barrage is a sort of inverted image of the case of Alba the GFP bunny (pictured above), where the artistic manipulation of an animal actually prevented the artist from caring for the creature. Photo by Chrystelle Fontaine, retrieved from http://www.ekac.org/gfpbunny.html. From a neuroscience perspective, if Silent Barrage was conscious, it was nothing near (even) rat-level consciousness. Keep in mind that this "brain" is actual made entirely of cerebral cortex, and therefore missing a brainstem- a condition that leads to coma in vivo (an unconscious state). Note, however, that the context usually created by the rest of the brain can in some ways be approximated using electrical stimulation. For example, one of the markers for consciousness (used to determine if locked-in patients are aware of their surroundings) is how evenly distributed electrical activity is in cortex- which can be tweaked in the culture by altering electrical stimulation patterns. Does this imply that Silent Barrage was "conscious" while being stimulated, but when the exhibit closed for the evening (and stimulation was switched off) it fell into a state of "unconsciousness?" While it is difficult (if not impossible) to definitively answer that question, we can at least speculate as to what Silent Barrage might have been conscious of, if it was in fact conscious of anything. In this case, the only information that Silent Barrage processes is the level of movement in its "field of view"- much like a T. Rex, Silent Barrage can't see you if you stay perfectly still. The inner life of Silent Barrage, if such a thing does exist, would consist entirely of observation of audience turbulence, with no emotional, motivational, or long term historical context. With no sensation of pain or pleasure and no ambition toward discernible goals , Silent Barrage begs about as much moral obligation towards itself as a desktop computer does. When deciding for ourselves whether or not 50 thousand cultured rat neurons controlling a robot in an art exhibition is "conscious" or not, it is interesting to examine the contrast between the neuroscientific sketch above, and the subjective experience of walking through Silent Barrage and feeling observed. The first, a mostly objective statement of fact, can tell us things about the nature of the hypothesized "mental life" of this strange entity, and compare it to things we have more experience with, but stops short of pointing a finger and doling out responsibility. The second doesn't necessarily add to the list of rational arguments that can be made about the nature of Silent Barrage's “mental life,” but it can more readily build a degree of empathy toward the work, an intuition that said “mental life” is real, and worth protecting. As ethical decisions are made through intuition as well as reasoning , both sides must be explored to fully understand the relevant factors behind this decision. Catts, O and Zurr, I. (2008) The Ethics of Experimental Engagement with the Manipulation of Life. Tactical Biopolitics: Art, Activism, and Technoscience. MIT Press. A procedure that had just recently begun to be performed by neuroscientists. DeMarse, T. B., Wagenaar, D. A., Blau, A. W. and Potter, S. M. (2001). The Neurally Controlled Animat: Biological Brains Acting with Simulated Bodies. Autonomous Robots 11: 305-310. Saper, CB. (2000) Brain Stem Modulation of Sensation, Movement, and Consciousness. Principles of Neural Science, 4th edition. McGraw-Hill New York. Again (when is this ever not the case?) see Kandel (reference 3). During non-REM sleep cortex appears to fire away in correlated sleep-spindles, while both REM sleep and wakefulness show more distributed activity. Interestingly enough, in the absence of driving sensory input cortical tissue naturally develops highly correlated activity- in the dish this is referred to as "population bursts," whereas in vivo one can see a propensity towards seizures in tissue deprived of its usual afferents . In the dish, this "sleep like" or "seizure like" activity can be broken up through certain types of electrical stimulation- in effect, sensory input brings the tissue out of a "sleep like" state. You can think of this effect as being much like how small controlled burns can prevent large uncontrolled forest fires. Wagenaar, D. A. Madhavan, R. Pine, J. and Potter, S. M. (2005) Controlling bursting in cortical cultures with closed-loop multi-electrode stimulation. J. Neuroscience 25: 680-688. What is becoming my favorite definition of consciousness- Stuart Sutherland (1989). Consciousness. Macmillan Dictionary of Psychology. Macmillan. Can be found here, among many others that help to illustrate the problem. Specific structures that play a role in these missing functions include the amygdala, the locus ceruleus, and the hippocampus. Note that cortex itself does play an important part in the regulation of emotion (specifically the cingulate and prefrontal parts of cerebral cortex), though in concert with other, missing structures. What I'm assuming here is that "emotion," at its core, requires information about the well being of an organism- whether predicted well being (fear or hope) or the current state of well being (happiness or misery). The neural system in Silent Barrage does not have direct access to such information. Interesting point about the relationship between consciousness and memory-- what is consciousness without any [temporal] context? Clearly it is not necessary (severely amnesic patients are conscious), yet in our intuitions about consciousness it's hard to imagine having inner life (and a sense of self) without binding in present, past, and future. I'm glad you brought that up, Teresa! Although SB is missing a hippocampus, and therefore we might also assume all the HM -like symptoms that go along with that (including the inability to create new, long term declarative memories), working memory (the ability to remember a telephone number for a few seconds while you jot it down) isn't necessarily removed as well (as far as I know working memory is a much more distributed phenomena, similar to procedural memory), providing a somewhat brief temporal context. That being said, the film 'Memento' and my own (exhaustive) experience daydreaming (both of which have debatable relevance to the question you raise) are all I can think of in terms of what it is actually like to be without long-term memory. Your comment on the sense of self raises a different issue- does "consciousness" require a sense of self? I don't think there is any way that SB could have a sense of self, much for the same reason I don't think it could have emotions- but it could still be "conscious" of it's environment- much like driving a car in stormy weather, where all of your attention is directed toward your environment and you don't have time to reflect on yourself.